I've noted many times before on this blog that one of my great regrets as a gamer is that there are games about which I had irrational prejudices back in the day, prejudices based largely on what the older guys I knew said about the games in question. While I eventually came to realize that the "wisdom" those older guys imparted was often half-baked, their influence over my opinion nevertheless remained for a long time. For that reason, I was unforgivably snobbish toward Ken St. Andre's Tunnels & Trolls for far too long, considering it a "silly" knock-off of Dungeons & Dragons. I know better now. And yet, like RuneQuest, T&T was -- and is -- a roleplaying game that fascinated me, even as I turned my nose up at it. Even now, I'm not entirely sure why that was. Some of it, no doubt, was a symptom of my formerly regular bouts of dissatisfaction with D&D. In the past, I used to find some aspect of Dungeons & Dragons annoying or uncongenial and I'd start to look about for alternatives to it. Another part of it, I think, is that Tunnels & Trolls seemed to exist in its own little world, by which I mean that its players and authors alike were quite content to simply do their own thing without apology. Don't like T&T? Think it's a "joke game?" Fine, whatever. Your loss. I've never met an evangelical T&T player, the kind of guy who goes on and on about how great his preferred game was, let alone how much better his game was than yours. They were always live and let live and, even in my younger, stupider days, I found their attitudes attractive. That's probably why, despite my frequent protestations to the contrary, I'd occasionally looked in on T&T to see how the other half lived. This was made even easier when a friend of mine bought a copy of the fifth edition boxed set sometime in the mid-80s. Though I questioned his wisdom in "wasting" his money on such a purchase, I was secretly glad he'd done so, because I knew it'd give me the chance to read the T&T rulebook at length on my own, something I'd never done before, instead relying on furtive glances at it in stores or at local game gatherings. This helped me begin to overcome my irrational dismissal of the game (though the spell names still rankled, I can't deny), though not enough that I'd embrace the game in any lasting way. In addition to the rulebook, my friend's boxed set also contained an adventure called Buffalo Castle. 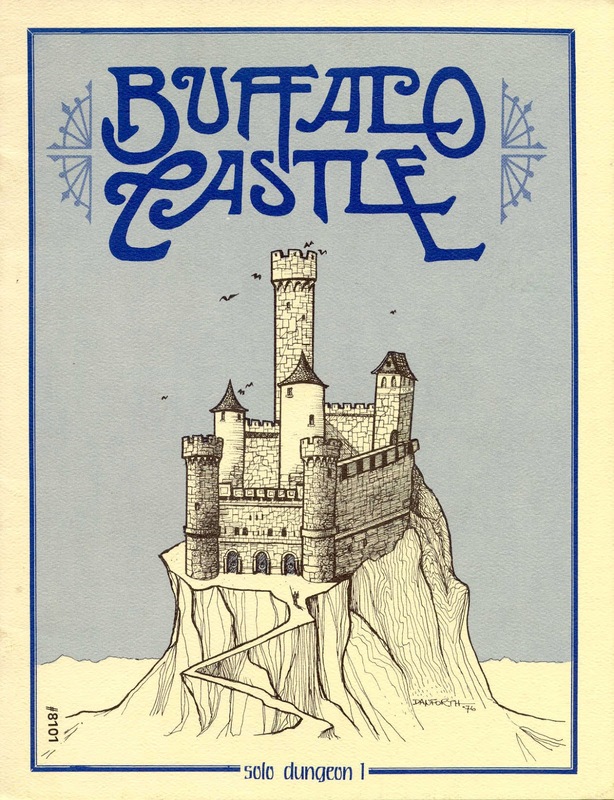 Buffalo Castle is a solitaire dungeon, first published in 1976 and written by Rick Loomis. It is, so far as I know, not only the first solitaire dungeon for T&T but the first solitaire dungeon of any type in the hobby, predating the Fighting Fantasy books by six years, which is quite an achievement. (The first Choose Your Own Adventure book was written in 1969, but did not see publication until the same year as Buffalo Castle; I have no idea if Loomis had seen a copy when he wrote his solitaire or even if the idea of solo adventures originated with him.) My old dismissiveness initially returned for a time, seeing solitaire dungeons for "real" RPGs (as opposed to gamebooks) as somehow beyond the pale, but my curiosity was powerful and I eventually borrowed Buffalo Castle from my friend and played it. I can't, in truth, say that Buffalo Castle is an amazing adventure. It's a rather limited -- and small -- dungeon crawl designed to be played only by fighter characters (no magic allowed). There are only about 150 entries in the whole 32-page book, most of them only a sentence or two long. Yet, there was something strangely compelling about it nonetheless. A surreality perhaps? This was a dungeon, after all, where you can find not only bored trolls guarding chests but also octopi and, yes, an enraged buffalo. There are deathtraps galore, as well as treasures like magic aspirin and diplomas from the Buffalo School of Dungeon Delving. This was nothing like the dungeons TSR published or that I imitated so studiously in my own games. This was different. I wasn't sure that I actually liked what made Buffalo Castle (and, by extension, T&T) so different from what I was used to, but I wasn't sure that I didn't like it either. The whole thing was so bizarre, so odd, that I don't think I ever sorted out my feelings toward it, except that I was pretty sure T&T was never going to replace D&D in my gaming group. And so it was. As I got older, though, my gaming style and preferences changed and I often found myself including bits of incongruous humor and weirdness in my adventures here and there, generally without rhyme or reason -- something to break up the staid seriousness that is the primary color of my imagination. Such oddities are still spices in my porridge rather than the main ingredients, but they're there nonetheless and, once upon a time, they weren't. Looking back now, I can't help but wonder if the seeds for this change were sown by T&T and Buffalo Castle without my realizing it. Fascinating story, and interesting to hear about a contrasting experience from the same period. I admit I am one of those T&Ters who enjoyed the game back in the 80's without concern for the rest of the hobby. I do remember it was generally a badge of honor to proudly state that we didn't care if Gary thought we were playing the right way or not, and Ken always went out of his way to emphasize that T&T was our game to use and abuse as we saw fit. I'd defected to T&T early on in my AD&D career precisely because I wanted to feel more liberated in how and what I did with my games; I jumped quickly to Runequest and Palladium as well. I even did a fanzine for T&T that ran for over forty issues. Anyway, the cool thing is T&T's fans are still out there, still in their own special sphere of the hobby and T&T is still thriving, now up to a 7.5 edition with tons of current support. I'm not nearly into it as I was back then...my gaming tastes ultimately stay with Runequest and its spin offs (Legend) these days and Pathfinder, but I still bring T&T out on occasion for one shots. I have some T&T stuff, and I've played it a few times, both in-person and online. I really like the mechanics, but the adventures have always bothered me. As nearly as I can tell, the intended strategy is to do the adventures in a certain order, so that you can double or triple certain key attributes and so survive the (insane) challenges of the later ones. Basically, I think it has solid mechanics but the playstyle espoused by their adventure design leaves me absolutely cold. T&T is deinitely a fun system. The lack of multiplayer adventurers (compared to solos) has been a real hole for the system. Hopefully with Ken working on an 8th edition, he'll emphasize group play. It's funny - I had a very similar experience except that it wasn't Tunnels and Trolls that led me down that path. It was actually a different "solo dungeon" experience - playing Zork. I didn't encounter T&T until much later, but when I did I recognized it as a kindred to the experience of playing Zork and dealing with the remnants of Lord Dimwit Flathead's Great Underground Empire, as well as some of the follow-on adventures. So I was prepared to love it. Thanks for the interesting comments. I had never seen a "choose your own adventure" book until long after I published Buffalo Castle. I always assumed they had copied me. I got the idea when a friend, Steve McAlister, commented "Someone ought to do a solo adventure like those "programmed text" math books". I thought this was a splendid idea, and immediately went home and wrote one. It is a fine example of my random sense of humor. By the way, I plan to publish an "updated" version soon! I'm not sure which solo I played, but I played one without even having T&T. I forget what I did to resolve things. It was kind of fun. The friend who introduced me to D&D's older brother was into T&T, and at a convention, the brother had purchased several T&T solo adventures, and me being bored at some point during the convention had a read through them. I did enjoy the adventure, but I count myself among those who have a hard time taking T&T seriously because of the silly sounding spell names. I did own Monsters Monsters for a while (am actually sad I got rid of it) and do have the 5th ed boxed set. I did look into T&T when I got the boxed set, but ultimately turned away from it because the advancement and combat systems seemed out of whack to me. I guess I can deal with D&D's massive power through level gains, but didn't cotton to T&T's massive power through increasing stats. My experience with T&T was kind of like yours. It was certainly an object of fascination. Although I never played it, I did have the fifth edition rulebook. For me, a big part of the allure was aesthetic. Liz Danforth's illustrations in particular, but the others as well, conveyed a very different picture than AD&D: somehow grittier, and stranger. Fang the Delectable is a good example of this, or the naked wizard summoning the demon in the room that also contains a pixie in a tiny cage. I find it hard to imagine either of these illustrations appearing in an official D&D work. T&T fascinates and frustrates me in equal measure. I'd enjoy it more if I felt that it actually "worked," but there seem to be too many ways to break the system. Maybe it's the people I play with, but we don't have that problem with other games of the same vintage. Yet something about it keeps calling me back for one more try at making it work. At least I appreciate its "do what thou wilt shall be the whole of the law" attitude to home-rulers. Frank: You do realize MonstersMonsters has been reprinted? Hey, I still have quite the quantity of those solo modules, including Buffalo Castle. The big/only appeal to T&T was the 'playable solo' aspect, and I had plenty of fun with those solo modules in the day. As sparse as they were, the GM adventures published for T&T are, nonetheless, quite good, and I would hold them up to any D&D module of the late 70s, early 80s. They take themselves more seriously than the bulk of the solos (although they were many serious-minded solos published) and the quality of writing is very good. Give them a look if you haven't already. No I hadn't, but not really surprised. Just would have been cool to still have the original. You missed out, James. Greatly. I grew up in and live in the Phoenix area, and have been acquainted with Rick Loomis and Ken St. Andre for three decades now. In fact they regularly host Nuclear War and T&T games at local cons wherever possible. In the early days, they also had a game store in the Scottsdale/Tempe Area, where I spent way too much high school age allowance money and college age beer money buying wargames, Traveller supplements, the occasional D&D Module, etc. Tunnels and Trolls was a fun system. While it did use a similar six characteristic, 3d6 range system, that's about where the similarities ended. Combat didn't use hit points, armor reduced damage, didn't make the target harder to hit, character advancement was a touch more realistic, but most of all it was just a fun, fast, system compared to AD&D. The spell names were funny, some of the solo dungeons and multiplayer dungeons were enjoyable, and it launched a couple of local folks on to bigger and better things...name Mike Stackpole (yes that, Mike Stackpole, who before he wrote novels wrote supplements for Tunnels and Trolls and its Pulp Era spinoff, Mercenaries, Spies, and Private Eyes) and Liz Danforth, who went on to illustrate for just about everybody in the 1980's. Judges Guild did a couple of T&T modules, too. Not sure if they were group oriented or solo. Rat on a Stick was a group/GM adventure campaign. Quite Silly, IMO, and Jungle of Lost Souls was a solo adventure penned by G. Arthur Rahman, who also penned a T&T solo published by Flying Buffalo, Sea of Mystery, as well as writing for the T&T magazine, Sorcerer's Apprentice. Rahman may be best known for designing the board game Divine Right. I learned about T&T from my friend JD. The solo dungeons hold a special place in my memories. There was a time that we would bring solos to Flying Buffalo Games on Friday and Sat (they had a game room!) and we'd have them as backup. If we couldn't find a game to play in or if we had finished the adventures we'd prepared, we'd all just dive into solos. A lot of the larger ones had good replay value. Yes! T&T, especially in its 5th edition, just looks so unlike D&D in any of its editions that it's very compelling. I'll be meeting Ken this summer when he comes to Toronto! Awesome that you're a Grognardia reader, Rick! I know I'm not the only one here who has enjoyed your work!